Can you confirm these amateur observations of Blanus strauchi? 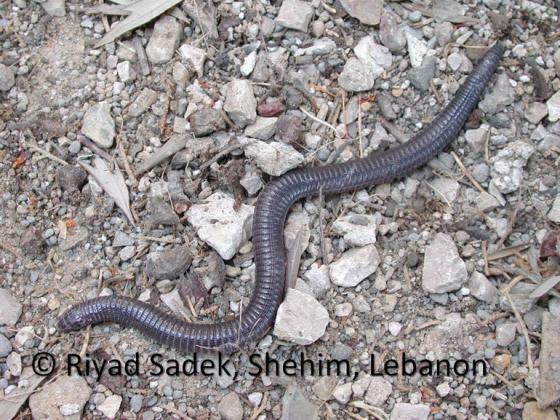 Type locality: ‘‘Smyrna’’ (Izmir, Turkey). Types Lectotype: BMNH 83.7.30.3 = RR1946.8.2.9 (designated by Alexander 1966). Paratypes: ZISP (formerly ZIL) 5903, plus three once in Bedriaga’s personal collection. Comment Distribution: Occurrence on Cyprus questionable (BAIER et al. 2009 and pers. comm.). Reports from Israel are from the 19th century, so probably not in Israel any more or it was never there. Synonymy: Baran (1977) concluded that only two subspecies can be identified in Turkey, B. s. strauchi and B. s. aporus, considering B. s. bedriagae as a synonym of B. s. strauchi. Etymology Named after Alexander Strauch (1832-1893), Russian zoologist.